It’s up to you to make your own style rules for your minimal wardrobe in order to craft a beautifully cohesive and versatile collection. I decided to ban heels from my personal 50-piece capsule wardrobe, they’re simply not comfortable or practical for my lifestyle. Unfortunately, heels are considered the ultimate classic go-to “smart option” for women and finding alternatives that are comfortable and formal can be a challenge. Here are my suggestions for smart alternatives to heels. These shoes were originally called Balmorals and were later renamed Oxfords after Oxford University. Traditionally they were plain, formal shoes and evolved into a varied range of styles to suit formal, uniform, and casual occasions. 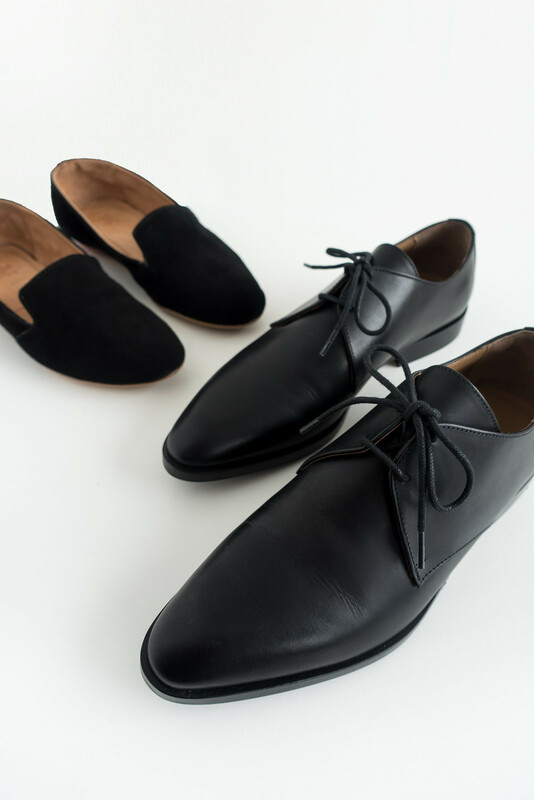 If you’re looking for a smart yet comfortable shoe that can be worn pretty much anywhere, pick a pair of Oxfords. I was missing a pair of go-to smart shoes and I was lucky enough to win a pair of Everlane’s new Modern Oxfords; with a gentle tapering to the toe, smooth design, and slight height on the heel, these shoes are a welcome addition to my wardrobe. Designed for horse-riding and walking by Queen Victoria’s shoemaker, the Chelsea boot is less formal and more practical with a close, ankle-high fit, low heel, and elastic side panel to make them easy to pull on and off. Depending on the style you go for, Chelsea boots aren’t always the ideal replacement to heels but they certainly work with most outfits and they’re neat enough not to look out of place as an alternative. My current pair were a cheap purchase from Monki, they’re a classic Chelsea boot design with a super comfortable fit. Slip-on loafers started out as casual shoes but have become more formal in style. The low heel, lace-less, and slip-on design makes these shoes easy to wear without compromising on classic style. They’re simple in appearance, which makes them an understated addition to an outfit, maximising on comfortable while remaining formal enough for evening wear. These classic Black Loafers from Sseko are streamlined with a simple shape, smooth-as-velvet suede, and cushioned insole to make them the ultimate comfortable alternative to heels.